Not in Knoxville?! You can still help foster families. See voucher below for details. Join us for a fun, pretend experience suitable for children and adults. Participants will play against other Hogwarts houses to see who can win the Quiz Master Cup. Children and adults are welcomed to place this fun game of wits and strategy as teams win and use spells against other teams. 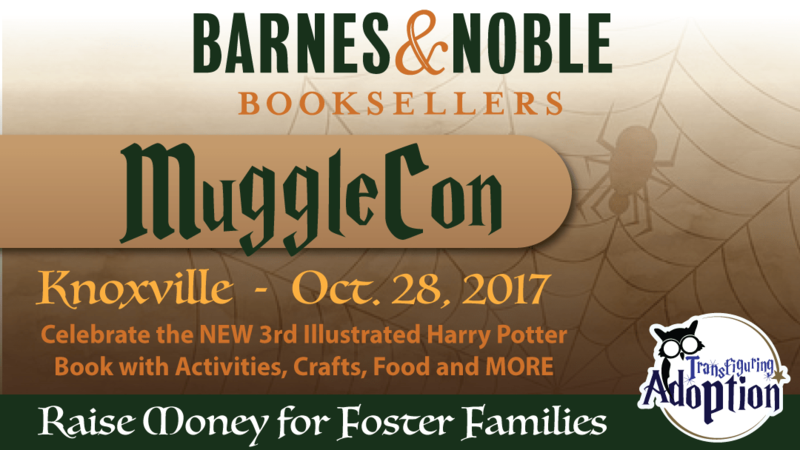 Nox Quidditch (Knoxville’s Community Team) will be on hand in the parking lot to give demonstrations and hands-on fun about he game of muggle quidditch. The team loves answering questions. Audience volunteers will be used as real life chess pieces as two of our champion chess players go head to head in the chess game of the century. Crafts, small activities, and a community puzzle table will be available to do on your own throughout the day. Harry Potter himself was an orphan and there are many children in United States that find themselves separated from their birth parents for a plethora of reasons. Unfortunately many foster parents would say that they are not equipped to handle trauma caused issues such as sexual abuse behaviors, malnutrition behaviors, PTSD, and so on. Transfiguring Adoption provides foster & adoptive parents tools and resources that allow them to better hand past trauma and nurture children. 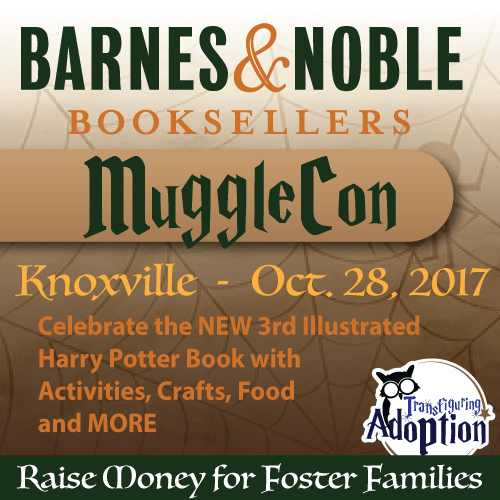 Everyone, EVERYWHERE can join Barnes & Noble Knoxville as they help support foster families. During October 28, 2017 a percentage of every purchase you make ONLINE or In Store goes funding resources for caregivers such as online learning panels, media discussion guides, foster family kits, and MUCH MORE. Present the voucher to a B&N staff member before making a purchase in-store or from the cafe. Online purchases: Visit bn.com/bookfairs to do your shopping. On the payment page make sure to choose the box, “Check if this is a bookfair order.” You will then be asked to type in the ID code on the voucher. Tell your friends to print the voucher and support the cause.